Below are some important notes on upgrading to Confluence 5.5. For details of the new features and improvements in this release, please read the Confluence 5.5 Release Notes. Database attachment storage has been deprecated in Confluence 5.5. If you currently store attachments in the database there will be no change, but you will not be able to switch to storing attachments in the database in Confluence 5.5. It is recommended to migrate database attachments from database to filesystem according to Attachment Storage Configuration as database attachment storage might cause problems with displaying/previewing attachments and videos files in newer Confluence versions starting from 5.9. We will not be providing a clustered version of Confluence 5.5. We are working on improving our clustering solution and expect to make it available later this year. Customers wishing to run Confluence in a cluster should continue to use Confluence 5.4. For add-on developers: A developer milestone (Confluence 5.5-m22) of our work so far is available to developers who want start working to ensure their add-on is cluster compatible. See How do I ensure my plugin works properly in a cluster? Note this milestone is not recommended or supported for production environments, and does not include all of the features in Confluence 5.5. This release includes several upgrade tasks. In very large instances it may take some time to complete the upgrade. The upgrade also includes a re-index of all users. You can check the status of the index queue by going to > General Configuration > Content Indexing > Queue Contents. The status will show as idle when the indexing is complete. Do not manually flush the index queue (or delete a space which automatically flushes the queue) until the indexing is complete. We are reducing some of the more repetitive Confluence notifications. Watchers of a page or space will no longer receive a notification as each individual attachment is added to a page in the editor. As part of our work on tasks, the Personal Tasks tab, previously accessed from the Notifications box in the header, has been removed. If a user has incomplete personal tasks, the first time they access the Personal Tasks tab Confluence will notify the user of this change and email any incomplete personal tasks to the user's registered email address. The email also provides instructions for how to add these tasks to a page so they can be managed as ordinary tasks. The wiki markup based Tasklist macro has been removed from the macro browser. Tasklist macros on existing pages will continue to work, but you'll be unable to add new Tasklists via the macro browser. Confluence creates a pre-upgrade partial database dump which may enable Atlassian or an Atlassian Expert to assist you with data recovery should a major problem occur during an upgrade (and you have no backup). The file created cannot be used in its raw state and and does not replace the need to perform a full database backup prior to upgrading. If you have a very large database (your database backups take a very long time to complete) and you are confident you have manually performed a full back up, you may turn off this operation. See this Knowledge base article information on how to use a system property to turn off this operation. A small change has been made to the Administration console. Some options previously under General Configuration now appear on the Further Configuration page. These settings can now be found under Further Configuration. The Cog menu has also changed. To access Confluence Admin choose > General Configuration. 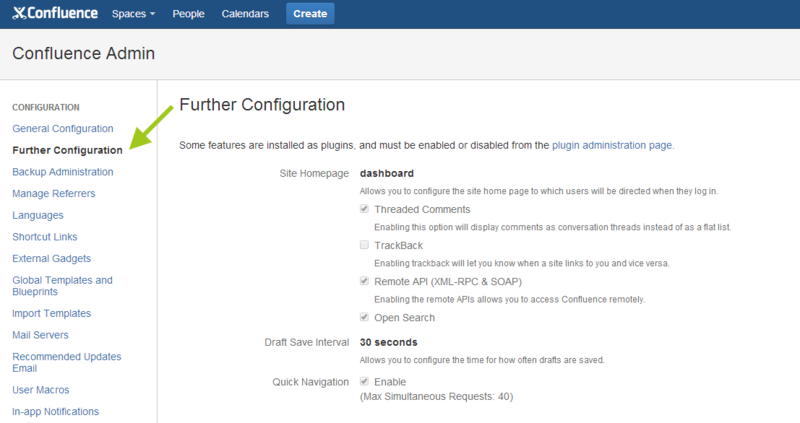 This will take you straight to the General Configuration page in the Confluence Administration console. If you want to administer users or add-ons there are now options in the cog menu to take you directly to those pages. Mail and JUnit Test result files cannot be imported from the server until these system properties are set. See Configuring System Properties for more information. For developers: The internal Atlassian dependencies for JIRA's source distribution are now Maven-based archives, rather than exports of the source repository for each dependency. There will be a Maven-based archive for each dependency, named <dependencyname-version>-sources.jar. For more information, see Preparing for Confluence 5.5. As previously announced, from this release onward we no longer offer support for PostgreSQL 8.3. See End of Support Announcements for Confluence for more information. We no longer support storing attachments on a WebDAV server (this feature has been deprecated since Confluence 2.7). This does not affect the WebDAV plugin. This release (Confluence 5.5) will be the last release that supports Tomcat 6.0.x. See End of Support Announcements for Confluence for more information. To allow us to dedicate resources to providing the best experience on modern browsers, Confluence 5.5 (including minor releases) is the last release that supports Internet Explorer 8 (IE8). If your version of Confluence is earlier than 5.4, read the release notes and upgrade guides for all releases between your version and the latest version.